The SSSP, Science Special Search Party (科学特捜隊 Kagaku Tokusō Tai? ), is a fictional organization from the 1966 tokusatsu TV series Ultraman. An International Science Police Organization, officially named the Science Special Investigation Team (科学特別捜査隊 Kagaku Tokubetsu Sōsa-tai?). Abbreviated as "The Science Patrol" (科特隊 Ka Toku-tai? lit. Special Department Team). Its basic designations are to seek out bizarre anomalies, and in special cases, protect the public from kaiju attacks. They have a headquarters set in Paris, India, and Bolivia that are mentioned in series, but they also have connections in New York, Middle East, Brazil, London, Moscow, and Turkey. Their telephone number is 999. In episode 16, after Alie Baltan II took over Dr. Mohri's ship, the Ohtori, Dr. Iwamoto built an armament on the Jet VTOL 117 by placing three hydrogen-rocket boosters that were powered by nuclear propulsion, naming it the Space VTOL (宇宙ビートル Uchū Bītoru?) in order to save Dr. Mohri before learning the latter had been possessed. It was later used when the Science Patrol had to investigate cases that took place in space (episodes 22, 33, 35). It is this incarnation of the Jet VTOL that is the subject of this kit. It would be remiss of me to not mention that I know pretty much nothing about Ultraman, other than it was and still is very popular. From what I gather, Hasegawa produced several different variants of this vehicle. This one as mentioned in the history, has the nuclear hydrogen rocket boosters along with the half circle support. Now if that doesn't just sound dangerous, I do not know what does! The kit itself comes with one of Hasegawa's super neat articulated stands, so that one simply has to place the model upon it when done. Two of the eight sprues are dedicated to this item. The interior is quite complete with three crew figures and it uses decals for the instruments which is just fine. One does have to drill a hole in the lower forward fuselage to attach a mounting piece. The interior and five piece main engine nozzle assembly are trapped between the upper and lower fuselage halves. The forward canards are a single piece on each side with the upper half of the tip pod molded in place. The underside is separate and gets attached early in the build. The main wings (rear) are upper and lower halves that will eventually interlock via long tabs. The cabin roof is a clear piece and Hasegawa provides masks for the windows. These need to be cut out from a solid sheet, but should be easy enough to do. Before attaching that, three crew members will need to be painted and glued in place. The windows are fairly large so much of the interior will be visible. Once the cockpit cover, wings, canards and fin are glued on, the rocket engines are assembled and, along with the half circle brace, are attached. There is a small winglet atop the upper engine, whose upper surface is white. Now Hasegawa does provide a decal for that as well as the front and rear of the wing tip rockets, but one may well wish to pai nt those areas rather than worry over a decal. No matter how one chooses to do it, Hasegawa provides decals for everything except for the overall color, which is silver and the outer canard pods, which are white. Interestingly, there are two decal options. These are nearly identical. 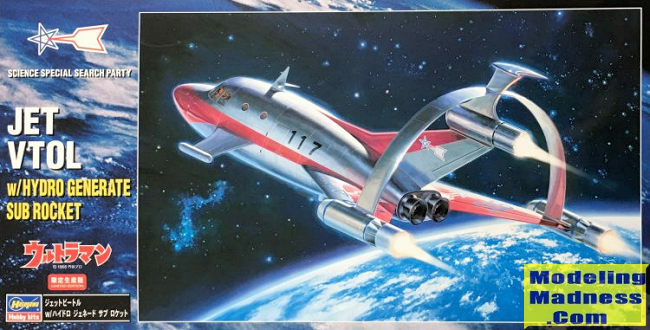 The box art vehicle is #117 and is lacking large, white trim decals on the underside and upper side of the fuselage. The other, SIII, has these large white markings. I don't know enough about the series to know which is appropriate for which episode, but it is nice to have the option. Decals are quite nicely done and the white is actually white and not off-white. 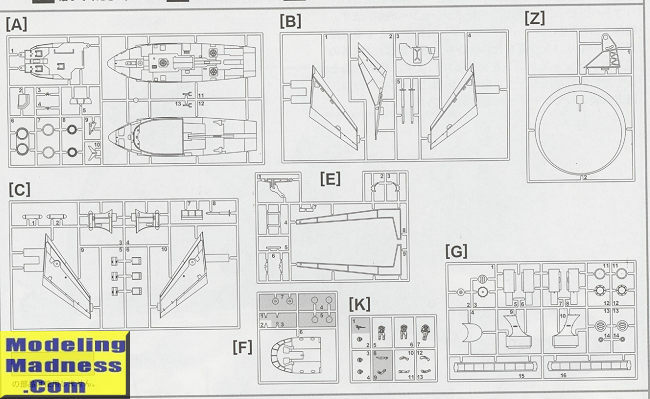 Instructions are typical Hasegawa with Gunze paint references. I pick up stuff like this because I think it is neat looking, and sometimes I'm introduced to neat subjects via various anime series that I watch. This is very definitely a 1960's sci-fi subject and if you like things a bit off a tangent, then it would be worth seeking.